With over 30 years retail experience I know how important customer service is and my aim is to always exceed your expectations. If you are looking for a carpet or any type of flooring contact me with your requirements and arrange for me to visit, You can choose in the comfort of your own home. No job is too small or too large and we offer a free measuring and quotation service. Choosing a carpets for a room is a crucial decision. To make this as easy as possible we come to you, giving you the opportunity to choose the style and design of your carpet in the room where it will be laid. With over 30 years experience we're well placed to help you make the right decision. We have a huge range of woven or tufted carpets from the best names in the industry. Including pure wool carpets and stain resistant options. Woven carpets have the advantage of being dimensionally stable and they retain their appearance. Whereas tufted carpets being generally plain in design but manufactured in an economic way, are great value for money. Our range of carpets will suit any tastes with patterns and colours that can create the right environment in any room. Strong colours will make a room feel smaller whereas lighter colours will make a room feel bigger, plus colours can also be used to influence the temperature feel of a room. Stripes are very effective on stairs with shaggy textures being used more in bedrooms as these all add more interest to the floor rather than just a plain flat finish. Nothing compares to the soft, luxurious feeling of carpet under your feet. Carpeting provides a safe, comfortable spot for kids to play and add the luxury feel that you might not experience with a vinyl or laminate floor. Yes a carpet requires a bit of extra maintenance compared to vinyl or tile, but there's simply no substitute in terms of sound absorption, warmth and overall comfort. We also supply an extensive range of vinyl floor coverings. Vinyl is without a doubt one of the most practical flooring types. Vinyl has become sophisticated in its manufacture, with wood and stone designs as well as modern patterns and metallics if you're looking to make a stylish statement. Vinyl is often mistaken for Linoleum (lino flooring); smooth flooring made from the natural materials of linseed oil, pine resin, wood flour, cork powder, limestone dust and jute. Lino floors were once very popular smooth floors, but are now replaced by vinyl flooring due to its cheaper price and easier maintenance. Laminate flooring is built from four basic layers that together make up a laminate floor plank. The top layer is a wear layer to add strength as well as heat and stain resistance to your laminate flooring. The second layer is the decor layer which is the part where the design is printed, so for example, the wood grain. The thickest layer of your laminate floor is the third layer which is specially formulated to add strength, stability and to prevent moisture from seeping through. The final layer of your laminate flooring is a backing to protect the laminate from moisture that comes from below your flooring, without this your laminate floor would warp so it's a really important part of making sure you have the best possible flooring. 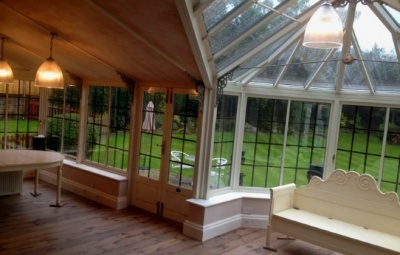 We source our solid wood flooring from Priory Hardwood Flooring who are based in Halifax, West Yorkshire. There are many different suppliers of wood floors . Some not always what they seem. Priory Hardwood Flooring have several ranges available, the Coniston Collection for example is their solid French oak collection:- "Coniston is a range of slow grown French Oak which can be supplied in a variety of widths, grades, thickness and finish options for a traditional floor which can seen in pubs, restaurants, hotels and high street stores nationwide. Although primarily used as flooring this range is also used as wall cladding giving and exceptionally hardwearing finish. This range is produced from selectively felled trees from the Loire Region. Woodlands are regularly monitored to ensure continued growth of strong, straight broadleaf trees. Thinning is a natural process carried out to ensure trees continue to gain the sunlight they require. As trees are felled and sunlight warms the forest floor shoots of regeneration can be seen." We source our bed from Linx Beds Limited. Here are a few details from their site:- "Hi, I'm Peter Hawes, director of Linx Beds Limited. I'm the industry authority on all things 'zip and link'. There are many bed outlets on the web, but we don't know of any that treat their customers as professionally as we do, just see what our customers say on Trust Pilot. We personally oversee the manufacturing of your product from beginning to end and co-ordinate the best delivery method for each and every customer whether you are buying a single headboard or a container load of beds being delivered to the other side of the world". The quality of these beds is outstanding. They are supplied Hotels and B&B S around the country now available to you.